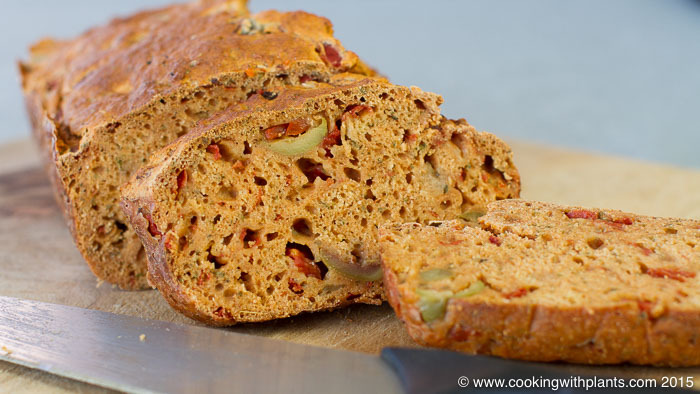 This no knead, no rise Olive and Cumin Spelt bread is so easy to make and tastes fantastic! You do not have to knead the dough and there is no time wasted by waiting for the dough to rise. Just mix the ingredients and bake in the oven – you’ll have fresh tasty bread in less than an hour! Line a bread pan with non-stick parchment paper. Combine all of the dry ingredients in a large mixing bowl and stir well to combine. Add the wet ingredients to the dry and stir well to combine. This will take a good minute or two. It may seem too dry at first, but keep mixing, it will all come together. Pour mixture into the bread pan and bake for 45 -55 minutes. Check with a skewer to see if the middle is cooked through. Let cool for at least half an hour for it to firm up and allow easy slicing. I sometimes cook for 45 minutes and then turn the oven off. I then let the loaf sit in the oven for an hour or two to cool as the oven cools. This sounds wonderful. Do you drain the canned tomatoes, or add the liquid? Thanks! Add the entire tin including the liquid. I love your videos & ideas, so creative =) I have a question how can I make a gluten-free version of this reciepie? I haven’t tried making a gluten free version yet. You could try a gluten free flour mix and some xanthum gum. I like your recipe and have tried some of them, they are wonderful! I love bake bread, and your bread looks so yummy! But I have a question: do you drain your canned tomatoes or use them with the liquid? Thank you for your recipes and sharing them! Thank you 🙂 Use them with the liquid. What about ground cumin if you don’t have whole seeds? You could try that but I like the whole seed. Sometimes ground cumin can taste a little bit bitter. I can’t find potato flour. What can I substitute? Thank you. I am so glad I found your site. You could use plain all purpose flour instead. Can I replace wholemeal spelt flour with whole wheat flour ? Hello Anja! I tried this recipe and unfortunately it became a real failure. The bread didn’t raise and after 55 minutes it was still wet inside, just like uncooked dough. I don’t underständ what I did wrong, I followed the video. In Sweden we use other measurements when we bake, deciliters instead of cups. 1 cup is about 2,5 dl. I don’t know if I put too much och too little of something. Do you have some advice? If it is too wet it definitely sounds like there was too much liquid. The cup I use = 250ml.